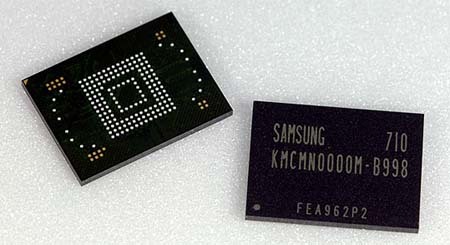 Samsung Electronics, a global leader in semiconductor and telecommunication has developed a 4GB multi-chip package (MCP) targeted at 3G mobile phones market. This innovation has eliminated the need to implement external memory card slot and software development for NAND memory that significantly simplifies the design and time-to-market for the mobile phone manufacturers. The new MCP integrates a 4GB embedded memory, which consists of 1Gb mobile DRAM and 2Gb NAND flash for mobile operation. On top of that, it combines two 16-Gb NAND flashes that can be used as permanent storage for multimedia files such as movie clips, mp3 songs, GPS (Global Positioning Satellite) map and etc. While providing high-density memory with small footprint, this solution also maintains high speed transmission with low noise interference which becomes an ideal choice for mobile market segment. Market researcher forecasts that the 3G mobile phone market is expected to reach 392 million units in 2007. This is definitely a good news for Samsung as where its market segment is.